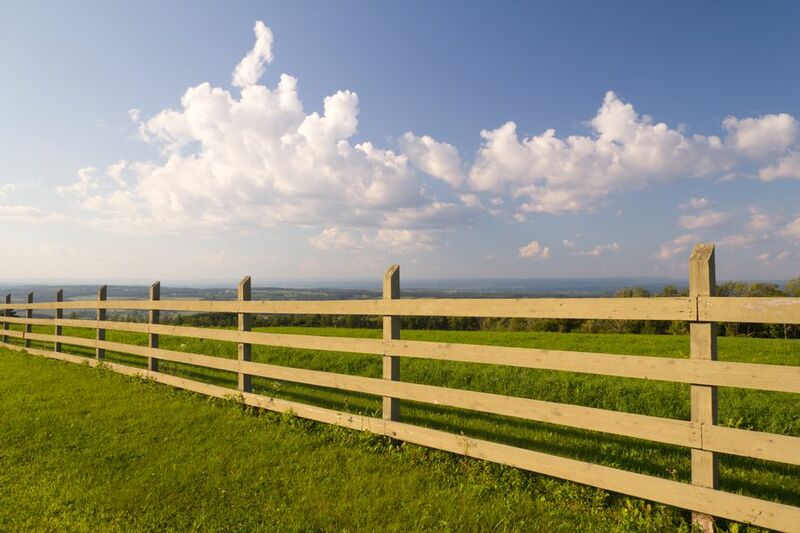 The following guidelines for replacing rotted or broken wood fence posts can be applied to any posts that support either slotted-rail or panel-type fencing. Time required: 1 to 2 hours. Remove the old wood fence post. Take the rails out of the rotted wood fence post if it is still standing and set them aside. Grab the old wood fence post and wiggle it—hard—in all directions until it loosens. Grasp the wood fence post firmly and pull it out of the ground. If it is broken, use a shovel to remove the part that remains in the ground. If the wood fence post is set into a concrete base, you can either dig up and remove the base or dig a new hole for the replacement wood fence post at a slight distance away from the original base. Clear out or dig a new hole to install a new wood fence post. For the best results, you’ll want to use a narrow shovel known as a post-hole digger for this step. To use this two-handled shovel, shove it into the ground as hard as you can, then pry apart the two handles. While holding the handles wide open, lift and remove the tool from the soil. The metal scoops on the bottom may hold only a handful or two of dirt: This is normal and not a reflection on your strength or skill. Deposit the soil on the ground or a tarp and continue to dig out the hole. Scrape as you dig. Use the prying end of a tamper tool to loosen the soil at the bottom of the hole and to scrape the sides, creating a narrow, straight-sided opening. Dig and scrape repeatedly until you reach the necessary depth to insert the new wood fence post. Usually, wood fence posts are 20 inches deep. If the original hole was not that deep, dig to a depth where the new support will be the same height as the other wood fence posts. Put the new wood fence post in the hole. Remember to line up the slots that accommodate the rails for the fencing. To make it perfect, measure the height of the lowest rail slot on the nearest standing wood fence post with a tape measure, then adjust the new support to match that height. Replace some of the soil at the bottom of the hole to help settle the new wood fence post. Hold the wood fence post plumb and level. Eyeball this or check it with a spirit level. While someone else is holding the wood fence post, shovel in soil and use the tamper end (the round part) of the tamper tool to firm up the soil around it as you go. If you don’t have a helper, you will need to stop shoveling periodically to right the new support so it is plumb (straight and erect) and level (its top is even with the next wood fence post in your fencing). Backfill the hole. Fill, check plumb and tamp until the hole is filled firmly and the new support stands straight. Tamp the soil around the new wood fence post as securely as you can. Put the rails back. Install the lower rail first, then the higher rails. Optional: secure the rails. Use a drill or power screwdriver to attach the wood fence post to the rails with a screw to prevent the rails from falling. Clean and oil your tools. Clean off your tools and oil the working parts of the post-hole digger before you put them away. Do You Need a Permit to Erect a Fence? How Do You Set a Fence Post?